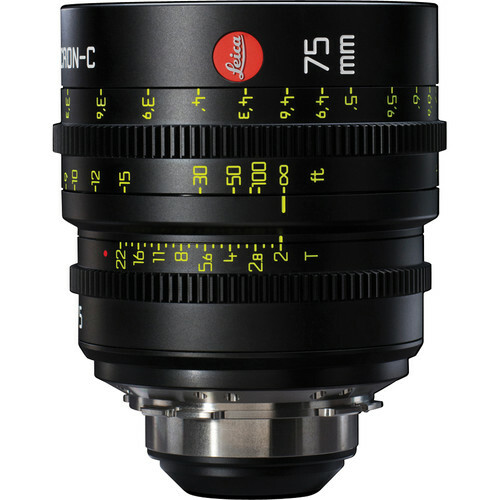 Designed for the digital cinema market, the Leica Summicron-C 75mm Lens (C for cinema) features a stainless steel PL mount and provides a smaller, lighter, albeit slower option to the renowned Summilux-C series of lenses. The 75mm focal length is considered on the long side, providing pleasing close-ups without extreme compression of the background. The small size of the lens makes it suitable not only for regular production, but also for stabilized rigs, aerial cinematography, and stereoscopic 3D capture. Projecting a useable image circle of 36mm in diameter, it is compatible with a variety of cameras that have sensors that are slightly larger than Super 35. The T2.0 maximum aperture is consistent among the range, so there is no concern about exposure variations when cutting between Summicron-C lenses. Each lens incorporates geared focus and iris control rings, which share the same position, so swapping lenses can be done without having to adjust your follow focus or lens control system. The lens features an internal focus design, which means a non-rotating front perfect for clip-on matte boxes. A generous number of focus marks are distributed along the dual focus scales, and the 300° of focus rotation provides for accurate focus pulling. The 95mm diameter front is standard across all Summicron-C lenses, and, except for the 18mm and 135mm, they feature similar weight and the same length. The Summicron-C lenses have an image circle of 36mm, which is more than generous enough to cover the sensors of many popular cameras, including the 6K Red Dragon Sensor, without vignetting. For reference, the image circle requirement for Super 35 is approximately 28mm. The lens is telecentric, which helps reduce illumination fall-off from light hitting the sensor at a sever angle outside of the image circle. The modern lens design as well as the cine manufacturing process and tight tolerances ensure low distortion, high resolution and excellent color rendition. Although made using spherical elements only, the Summicron-C lenses provide a sharp image with a naturalistic Bokeh. The 300° of focus rotation provide for extremely accurate focus marks and focus pulls. Consistent front diameter and shared focus and iris ring position from lens-to-lens in the series allow for faster lens changes requiring less adjustment of matte boxes and lens accessories. Box Dimensions (LxWxH) 8.3 x 6.5 x 6.4"